If you're a PC user, Windows 8 is coming to get you whether you like it or not. Upgrade prices are thoroughly reasonable and you should see a performance increase no matter how old your system is. But before you buy it, you should probably read our mammoth review, because Windows has changed… a lot. This week we've also been looking at a wide range of other exciting gear, so check it out and let @techradar know what's on your techy wish list! A price tag of £5,299/$6,799 brings certain expectations, and the Canon EOS-1DX's build lives up to them. This is a camera that you can expect to survive several years of heavy use. Thanks to the control layout and deep comfortable grips it is also one that you can enjoy using. 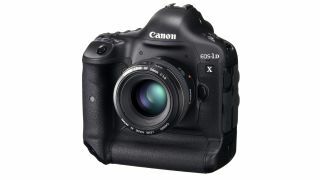 The Canon EOS-1DX's noise control and autofocus performance particularly impress, and these are key areas for professional photojournalists who need a camera that they can rely on to get a decent image, whatever the conditions. With an f/2.8 lens, the 1DX can focus in very low light, and even at high sensitivities it delivers images that are clean enough to turn into full-page prints. Windows 8 is faster - you'll notice the difference on older PCs as much as on new ones. Battery life improves enough to be noticeable. And it's significantly more secure. That makes the low upgrade price a bargain, and given that you can upgrade from any version of Windows, you only need to pay more than the upgrade price if you're building a new PC from parts. And then there are the features, such as Storage Space and File History, or the new Windows Explorer, or better multi-monitor support. The charm bar, especially the handy icons on the Setting bar, puts most of the tools you actually use to manage your PC at your fingertips. The cloud integration in Windows 8 is a game changer. As small, affordable upgrade to a BT Vision box, we can see YouView carving a tidy little niche. As a stand-alone service for the rest of us, YouView could be a world-beater - and the addition of Sky Movies via Now TV will attract some. Still, we're sure YouView was primarily meant to be for those who want to watch EastEnders reruns from the previous day without firing up a laptop; the creators of this platform will have to be very careful in adding apps and services that dilute its free-to-air roots. Perhaps content from the likes of Now TV and other on-demand film apps such as Netflix, Lovefilm or Acetrax should only be present on YouView if you activate them. Its development will be interesting to watch, though we do know one thing; YouView is so much nicer to use than separate apps on a smart TV.